In the summer of 1944, Germans began deploying the Messerschmitt 262 and the Arado 234 in small numbers. Tactics for both aircraft were developed quickly under adverse combat conditions. Several test Kommandos were formed to execute this difficult task. The Me 262 units soon discovered that the standard bomber attack tactics were not feasible in the new jet. Head-on attacks would not work as the closure rate between aircraft reached 700 mph. Pilots did not have enough time to aim and fire their cannon. Overhead passes would not work either, for similar reasons. 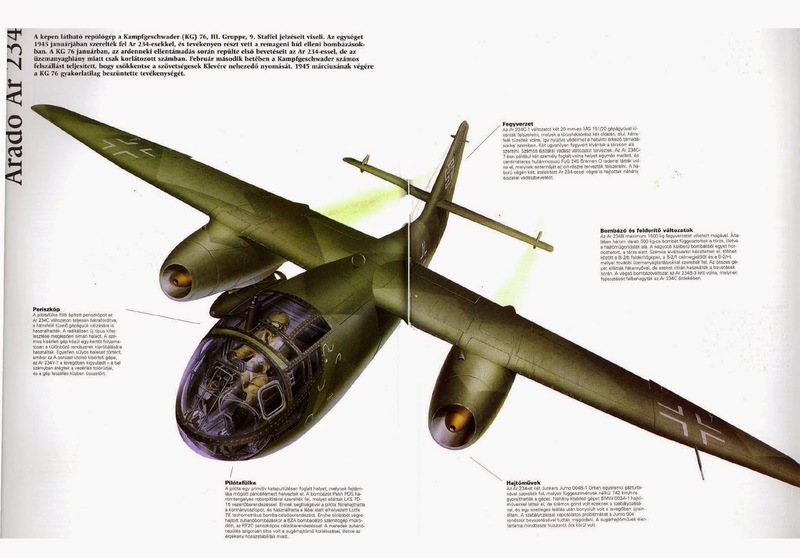 The Me 262 pilots learned that the best approach to bomber attacks was from the rear. They would race up above and behind a bomber box at high speed, then dive down about a mile astern of the American formation. They would then set up their attack runs, fire rocket and cannon volleys while still out of range of the bomber's defensive machine guns, then break off to head for home. The Arado 234 entered service as a light bomber in December 1944. 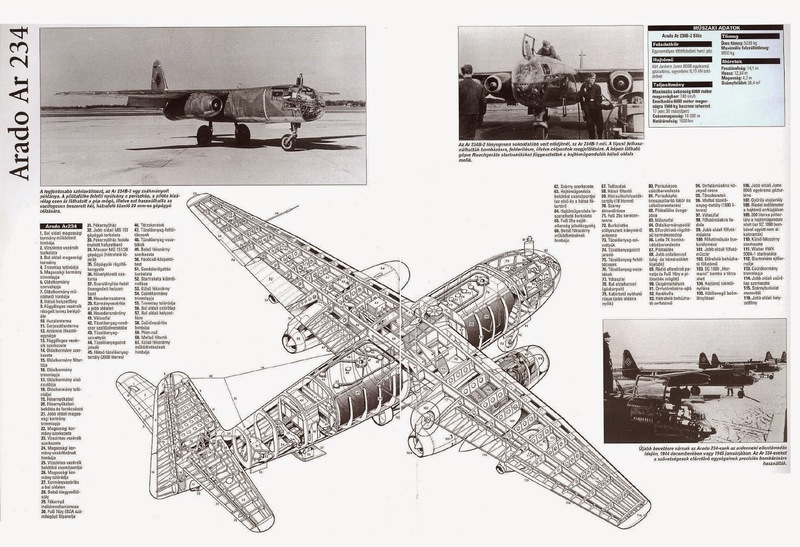 Originally, the plane was supposed to be used as a level bombing platform. A bombsight was mounted in the Arados nose, but to get to it, the pilot had to wrench the control yoke to the right, climb out of his seat, and curl up in the nose. Since no one else was in the plane to fly it, the setup invited disaster. The bombsight was probably never used in combat. Instead, pilots would reverse the periscope and put the crosshairs on their target. If the plane was in a shallow dive, the periscope sight proved fairly accurate. The shallow, high-speed dive from above 10,000 feet became one of the most widely used tactics by Arado 234 squadrons. Each service used their fighters in slightly different ways during the Second World War. The prime task for American fighters was the protection of the bomber stream. For the British, air superiority over the battlefield was the primary mission. The Germans, forced onto the defensive by late 1942, adopted a reactive stance in the West. To counter the Allied air offensive, the Luftwaffe deployed the bulk of their jagdgeschwaders in Germany to serve as an interceptor force. Even with new tactics and new weapons, however, their fighter groups never had a chance at stopping the American daylight bombing raids. There were simply too many Allied aircraft to stop. The war over Western Europe turned into a massive battle of attrition by the beginning of 1944. Each side trying to execute its mission objectives, took heavy losses. The deciding factor would be which side had the greater resources to replace losses. As it happened, the American Army Air Force had the greatest pool of resources. The British, after five years of war, were running into severe and insoluble manpower shortages by 1944. The Germans faced similar shortages. The Luftwaffe began losing an incredible number of pilots beginning in January 1944. These losses, sometimes approaching 1,000 pilots a month, doomed the German air force. With their veteran pilots depleted, they accelerated training programs to make up the difference. By doing so, however, they created a cadre of aviators so inexperienced that they proved to be nearly useless against Allied fighters, and German losses increased. This vicious circle had decimated the Luftwaffe by the end of 1944. Each graduating class from the training schools was less qualified and suffered a higher loss rate in combat than its predecessor. There was no way to escape this turn of events, and it doomed the Luftwaffe to a total, bloody defeat.